Polenta is an easy-to-please Italian staple that can be transformed into sweet or savory dishes. Below, we explain what polenta is made of and how to cook it. Polenta is made of stone-ground dried yellow corn kernels that have a flaky texture. Polenta is similar to southern grits in both taste and preparation but there is one key difference. The kernels used for polenta come from flint corn, which is a hearty variety of corn originally found in Italy. Compared to dent corn, which is used to make grits, flint corn has less starch, meaning that polenta is not as creamy and velvety as grits (but decadent nonetheless). 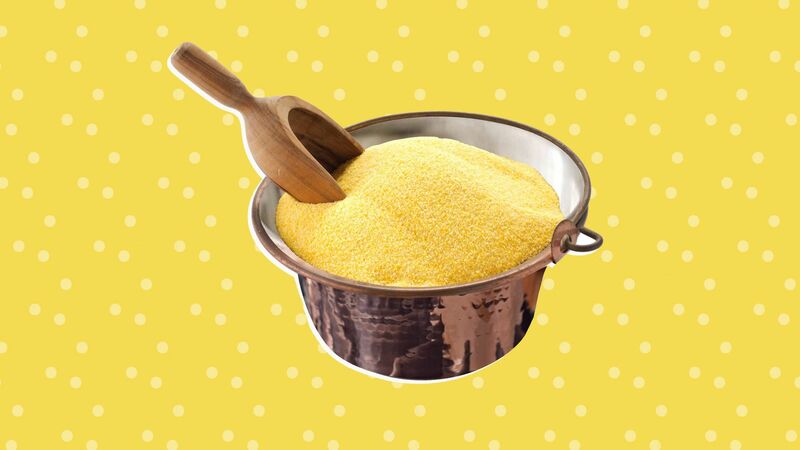 Some polenta recipes call for cornmeal, not polenta specifically. While cornmeal works as a substitute, it is ground more finely than the corn used for traditional polenta and therefore lacks texture. When shopping for polenta, look for packages clearly labeled “polenta,” like Bob’s Red Mill polenta ($3; bobsredmill.com). Of course, if you can find heirloom polenta, stock up as it will have unbelievable texture and a bright flavor. Stay away from instant, quick-cooking, or tubed polenta; while their convenience is appealing, they’re often bland and mushy. Cooking polenta is not nearly as tedious or high maintenance as you may expect. While it does require frequent stirring, you can easily prep the rest of your meal in the time it takes to cook. If you want to go the extra mile, use a traditional copper polenta pot ($200; williams-sonoma.com), but any 3 to 4-quart pot will do the trick. To cook basic polenta at home, bring 4 cups of water or chicken stock to a rapid boil in a medium-sized sauce pan. For extra flavor, add 1 bay leaf or a few sprigs of thyme to infuse the liquid with earthy notes. Once the water is boiling, slowly whisk in 1 cup of polenta and 1 teaspoon kosher salt in an even stream. Continue whisking for two minutes. Reduce heat to medium low and cook, stirring occasionally to prevent the polenta from sticking to the bottom of the pot and lumps from forming, until super smooth and creamy, about 40 minutes. Carefully remove the bay or thyme if using, and remove from heat. Whisk in 4 tablespoons unsalted butter, ½ teaspoon kosher salt, and ½ teaspoon black pepper. Feel free to sprinkle in ¼ cup freshly grated parmesan for additional richness. Polenta is a versatile base for both sweet and savory dishes. Some of our favorite polenta recipes include wild mushroom and tomato polenta, creamy polenta with sausage and chard, deep dish polenta pizza (yes, really! ), and polenta bake with shrimp. Craving something sweet? Try making a polenta dessert like lemon polenta pistachio buttons or upside-down apple polenta cake.